It’s inevitable that at some point in your motorcycling career, you will find yourself standing on the roadside by your disabled machine. The question now becomes, “What are you gonna do about it?” Most of us are curiously unprepared for this eventuality. Our modern bikes are so reliable that we’ve been lulled into a false sense of security. Besides, help is only as far away as a cellphone. Yeah, right! So, starting with this issue, we will develop some strategies for coping with a roadside emergency. It seems appropriate that we should start with the wholly inadequate factory toolkit. Yours probably looks much like the one shown. The toolkit must be the last thing manufacturers consider when designing their sparkling new machines. I am amazed at how few useful tools are actually included in those little plastic pouches. Perhaps it’s because our bikes, like modern cars, are beyond our ability to repair. And yet, it is often the simplest of problems that sideline our travels. Every factory toolkit needs some work. For instance, one of the first tools I toss is the universally awful screwdriver. It gets replaced with a tool that uses bits stored in its handle. You’ll want a variety of Phillips, flat-heads, and, if your bike requires them, Torx bits. And, there are other tools that need replacing. All the hex-head wrenches are chunked in favor of real tools that have extended handles and “round” heads, so you can actually reach the screw that needs your attention. 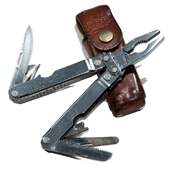 The cheap “pliers” are replaced with adjustable versions like Channellock® or another quality brand. 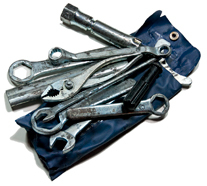 Factory open-end or box-end wrenches are usually okay for roadside use, but you may want to include some other sizes and maybe even some of the new ratcheting wrenches from GearWrench® or others. I usually keep the factory spark-plug wrench and, of course, any special tools that were included. Now comes the fun part. What do you add to make the kit more useful? Handy dandy multi-tool. Many brands available. Pick your favorite. I’ve found that a multi-tool can be invaluable. My personal favorite is the SOG S44 PowerPlier®. I once used mine to do a roadside fix on a leaking carburetor and to cut the end of a nice cigar (not at the same time). What if something actually breaks or you have a minor get off? Duct tape can be used to hold almost anything together until it can be repaired. Roll the tape, starting at the free end, into a tight tube (sticky side in) to save packing space. I also like the metalized tape with a paper backing. It has a stronger grip, can repair a hole in a muffler, or be used as a heat shield or safety reflector. A small, unopened tube of superglue or 5 minute epoxy will last almost forever and can be used to fix broken plastic and metal. Clear RTV silicone adhesive can repair a leaking rain suit or boot or a split fork gator or mend a tear in a saddle. Plastic zip ties should be in every kit. They pack easily, take little space, and can be used to secure broken bits while traveling. I’ve used zip ties to repair tank bag straps, mount a cracked license plate, and fix a broken GPS mount. I’ve even used one to hold my camera together after dropping it while taking pictures. An LED flashlight is essential. 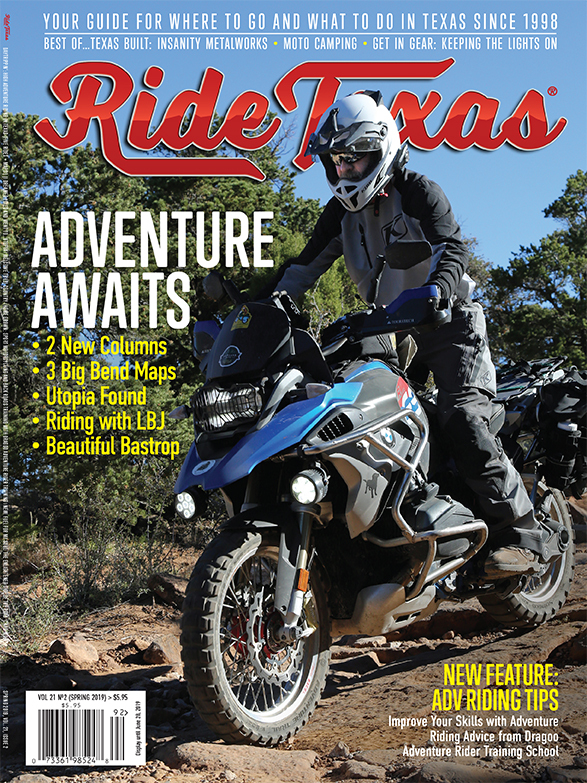 Use it to check oil levels while stopped, read a map, find a blown fuse, and make scary faces to amuse your friends. I like the all metal kind such as the LED Mini Maglite®. It also has a strobe function you can use as an emergency flasher. They are inexpensive, readily available, and will run for hours on two AA batteries. Try to think of Murphy’s Law as you put together your tool kit. Speaking of fuses, carry a handful, or at least a small box with a variety of sizes. Tape them inside your fuse box for easy access. Make sure you have an extraction tool and never replace a fuse with one of a higher value. That’s asking for trouble. Try to fix the reason the fuse blew in the first place, before replacing it. Something to repair and inflate a flat tire is also desirable. 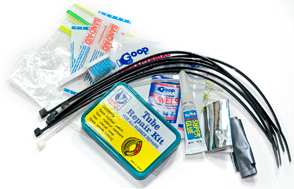 One of the many varieties of plug kits for your tubeless tires is essential. You can use CO2 cartridges to inflate your tire, but electric air pumps the size of your hand are faster and won’t run out of air. Make sure you have a place to plug the pump into your bike’s 12v system. I even carry tire irons, strapped to the bag mounts on my BMW F650GS, and a tube patch kit to fix my tire’s inner tube. Don’t forget, if you’ve added any accessories to your machine, you’ll want to include tools you’ll need to service these items. Check your toolkit to make sure you have the proper wrench to tighten that new set of highway pegs you just added. 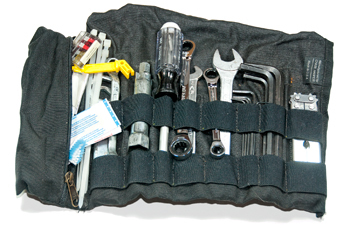 You may need a new “tool roll” to hold all your stuff. They are available in a variety of shapes and sizes. They will usually last a lot longer than the original plastic pouch. Wrap the roll with a couple of clean rags and carry small packs of hand cleaner to wash up before you ride. 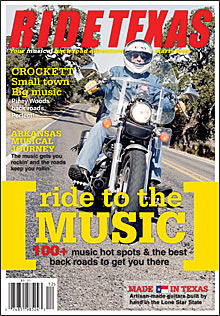 CruzTools® and Bikemaster® market a line of already assembled tool kits, if you’d prefer to go that route. Some are even bike specific. I’d still check out the kit to make sure you have all you need. We’ve included a list of recommended tools and other bits we’ve found useful on our trips. Use it as a starting point for your own list. Add to it as you gain more experience. You’ll never regret taking the time to put together a well-planned tool kit. With a little planning, you won’t become a roadside causality. And, you will amaze your friends with your self sufficiency.